"How To Avoid The 11 HUGE Mistakes That Ruin Most Senior Portraits..."
It's a good thing you're checking this site out right now! That tells me it's important to you that your senior pictures (or your son's or daughter's) look really fantastic. And yes, class of 2009-10 seniors are being photographed RIGHT NOW! "I was more than satisfied with my Senior portraits that Wayne and Patti took. I felt really comfortable during the session and they both made it really fun for me. The two of them had tons of creative ideas, making them unique, which is exactly what I was looking for. Thanks again Wayne and Patti for making my Senior pictures a memorable experience." Okay - Admit it. You Really DO WANT These Photographs To Look Fantastic, Don't You? From a graduating senior's point of view, nothing could be more disappointing than not liking the way he or she looks in that super-important portrait that all his or her friends and relatives will see! On this webpage, I'm going to reveal some powerful secrets to helping seniors look great in their portraits! Think about this a moment... more people will see this portrait than ANY OTHER PHOTOGRAPH you ever have taken! Yes! Even more than will see your wedding photographs! So you want him to be really proud of it? Right? 2.) They also want the portrait to have some kind of "artistic quality" to it. That is to say that the photographs themselves to look fantastic, as well as the senior looking fantastic in them. There's a three dimensional feeling to it, and there's quality to the light. And his or her personality comes through. The portrait has what I call "SPARKLE" to it. By "Sparkle" I mean that when the senior's friends and family look at this portrait, they say, "Wow, you look like a million bucks! It's like you're going to step right off the paper and speak to me! This photo of you is really great!" That's what I call "Sparkle." And I'm going to do everything I can to help your senior portraits have that special "SPARKLE!" Why? Because I love photographing seniors! It's what I do with a passion! You want to look fantastic in these photographs, and I'm going to help you achieve that! Here's How To Avoid The 11 Huge Mistakes That 9 Out Of 10 Seniors Make With Their Senior Portrait! Let's go through the 11 huge mistakes that 90% of all seniors and their parents make when it comes to their senior portraits. Obviously, you should contact me right away about whether or not I have any openings left to create your senior portrait. I am extremely booked up already, but hopefully I still have some openings so I can do your senior portraits for you. But that's not the point of this website. The point of this website is to give you these 11 major mistakes that most seniors make in reference to their senior portraits. If you don't decide to work with me, that's fine. I still want you to be aware of these major mistakes, so you don't make them yourself when planning your portrait! "WOW !! I had such a great time at my session !! Having two photographers for your Senior session rocks !! They continually try to outdo each other and as a result I benefit with great poses and candids. I've had more great comments about my photographs! I can't believe how great you made me look in them !" P.S. Because of their heavy wedding and family schedule, Wayne and Patti only do a couple of dozen Seniors each year. Consider yourself LUCKY if they take you on as a client. Mistake #1 Ruins More Senior Portraits Than Anything! Mistake #1 is wearing the wrong clothes! This is very normal. Even if the senior were a professional model, he or she still wouldn't know what to wear that would help him or her look the very best in a still photo. The "Art Director" would say what to wear! The "model" would just show up, and do what he's told! The hair person does the hair. The Art Director plans everything and tells the subject what to do next. You see, people don't know what really photographs well. They just don't know. Well, we know. That's our job. And we love it. And we're really, really good at helping you select the best clothing for your photographs - clothing that will help you look your very best. We will help you with this. Don't worry. For example, the wrong clothing can make up to a 44 pound difference in the way you look in your portrait! 44 pounds!!! Now, most high school seniors want to look as thin as possible in their portraits. Clothing makes a HUGE difference in this area, so let's make sure your clothing is really perfect! Mistake #2 Is A HUGE Destroyer Of Senior Portraits! Mistake #2 is making mistakes with hair. Many seniors goof this up in several ways. But also, most photographers goof this up, too, because they don't know how to photograph hair properly. This is such a big point! As you know, your hair is a huge part of your appearance. It can make or break how you look. We've all had "bad hair days" and if your photographer doesn't know what he or she is doing, your photographs will look like a permanent "bad hair" day. One of the things that separates my photography from that of most of the other photographers in the area is that I pay as much attention to the light that is lighting your hair, as I do to the lighting that is illuminating your face. And they are completely different lights! You see, if you study Hollywood Portraiture of the stars, you begin to see how careful the photographers are about lighting the hair. Well, I've studied the best professional Hollywood photo masters - such as Robert Alexander, who is responsible for many of the finest portraits ever created of the Hollywood Stars. And I'm going to use these very same techniques to create your senior portraits to help you, and your hair look really, really perfect. For example, many seniors who go to other photographers often complain that, if they have dark hair, that their hair seems to disappear into the background. Or, if they have light hair, that their hair has no "life" or detail in the photograph. Or if their hair is brown, that it doesn't look as great as they wanted it to. It's not just how they combed or prepared it, it's how it's lit in the photograph, too! Well, that's not ever going to happen to a portrait created by me, because I'm going to take the time and the care in the lighting of your hair so it looks absolutely perfect. It's as if one of these Hollywood Master Photographers just finished photographing Freddie Prinze Jr. or Jennifer Love Hewitt, and now is going to do your portrait, and I'm going to put as much care into lighting you as they would! "I just wanted to thank you for making my senior photography experience. My photographs turned out better than I ever could have imagined....It was really fun to see the variety of poses and the different locations were definitely unique." Mistake #3 - An Amazing Secret Revealed! Okay, you and I have to talk about blemishes here. If you (or your son or daughter) has some, and who doesn't, you're probably worried about whether or not they will show in this portrait. The HUGE mistake that almost EVERY SENIOR makes is that they don't ask the photographer about retouching before having the photos taken. I know, every senior is embarrassed about blemishes, and doesn't want to talk about it to ANYONE - especially a person they just met. But this portrait is really important, and you want to look REALLY GREAT in it, so we need to talk about this blemish thing. The secret: Be absolutely positively sure that your photographer is going to carefully and painstakingly RETOUCH all your portraits - and do it to perfection! In my humble opinion, a portrait that is not professionally retouched is NOT A PORTRAIT! It's just a "picture" that no one cares enough about to properly finish and produce to the best quality that money can buy! You see, what this all "boils down to" is you want a photographer who is going to take good care of you. Someone whose only goal is to help seniors look absolutely perfect in their portraits! And that's what we are all about. Taking the time, and putting forth the effort to spare no expense in helping you look really attractive -better than you've ever looked - in your senior photographs! "This multi image photograph typifies our desire to WOW you. The image was made utilizing three exposures. One of Olivia, one at Bridge Park and one along the Mississippi river. Each exposure has to be balance perfectly with the others to make this collage look awesome." Mistake #4 Is A "Silent Killer" Of Senior Portraits! Most seniors don't understand (or don't want to admit) that they get nervous in front of a camera. And they don't know what to do about it. You see, there are over 30 muscles in your face. And if you're tense, these muscles tense up, and therefore, you won't like the photographs. You won't know why you don't like 'em. You just won't. One of the keys to our success in photography, is that we will not photograph any senior, without having met them in advance. And what's the purpose of this? Yes, we're going to talk about clothing, and all the other things. But the main purpose of this meeting is to give you the chance to meet us, get to know us, and see just how well we are going to take care of you through this. You will see the studio. We'll give you a tour. We'll spend time with you so you begin to feel comfortable and confident about how you can trust us and take our advice. This is going to make an enormous difference in how natural and confident you look on the day of your photography! It's almost like magic! You will be impressed! I can't stress this enough. You see, most photographers just are not willing to do this. Why? Because it takes time. All they want to do is crank people through their studio like a "factory." They want to do your photograph as if they were building a car. They want to put you on the assembly line, and run you through, click-click-click-turn this way - click, etc....Next person please. We will not do that to you. We're going to meet you ahead of time, and we're going to treat this as if it were the most important photo of your life - because it is. See what a huge difference this will make in how you feel on the day of your photography? You'll feel great. You'll have met us. You'll have seen the studio. You'll know that what you're wearing is perfect. You'll know that your hair is going to look perfect. You'll know that no blemishes will show! So You'll be confident, and excited - not nervous and apprehensive. If You Aren't Aware Of It! Most seniors don't realize that it takes longer than 10 minutes to create outstanding senior portraits. One of the unique things that separates us from all the other photographers in the area, is that we take all the time that is necessary to create portraits that you will be proud of. Photographs that your friends and relatives will really like - yes like! That's what we're all about. We're not going to rush you through like it's a factory. We're going to help you through this whole thing. We understand that this portrait is important to you, so we're not going to rush through this. Your Appearance In Your Portrait! Most seniors don't realize that sometimes, "today is just not the day" for their senior portrait to be done. The hair just isn't right today. Or maybe you didn't sleep well last night. Or perhaps you've had too many stresses at school or home. Or maybe you just had a fight with your boyfriend or girlfriend, etc. Well, we understand this. We honestly understand that the day we set up for your photography may end up not being the best day, when it arrives, for whatever reason. And we have absolutely no problem, whatsoever, with you calling us and rescheduling the session, if "today isn't the day." We WANT YOU TO DO THAT! You see, one of the things that is really unique about us, is how easy and fun we are to work with. So, for example, let's say you end up deciding to have us create your senior portraits, and we set up a time for your session for Tuesday, the 15th at 3:30pm. Well, let's say you wake up that Tuesday, and just "doesn't feel right." Plus, your hair isn't cooperating that morning, and you're really tired, too. Well, you just call us. You say, "Hi, today just isn't the day. I'm really sorry." And we will immediately understand and know exactly what you mean. And we will reschedule the session for you - no problem. Now, we are terribly busy, and booked up, BUT, WE DON'T TREAT YOU LIKE A FACTORY. We understand. We won't make you feel guilty. Why? Because we've been doing this for over 14 years, and we completely understand exactly how you feel! It's no problem at all. We understand this is a once-in-a-life-time thing. Now, I know what you are thinking. You're thinking, "Give me a break. This is just a photo." Well, yes, but it's your SENIOR PORTRAIT, and it's the only one you're ever going to have. And all the people who matter to you are going to see this portrait! So let's make darn sure it's fantastic! Right? And that's what we're all about. That's what's so special about us. It's not the film we use. It's not the camera we use. It's not the backgrounds we use. (Although we use the best of everything!) The thing that separates us from everyone else, is how sincerely we want to help you look absolutely perfect - stunning - fantastic - better than ever - in your senior photographs. Seniors (and an awful lot of photographers) don't realize how important light is in photography. The wrong light, and the wrong direction of light can add up to 27 pounds to you on film, and also, bring out your worst features! It's really a matter of life or death in portraiture. The light is the "paint brush" with which I "paint" your senior portrait. It's very important! Now, one of the things that separates my photography from all the other photographers in the area is that I have studied light from the true Masters of fine portraiture for over 14 years. I understand that there is only ONE type and direction of light that will help you look your VERY BEST. Only one. And this is different for every person! Again, that's another reason we must meet you in advance, so we can determine the very BEST LIGHT for you and have it ready to use at your session day and time. You see, there are five major highlight areas on your face. And they must be PERFECTLY lighted, or you won't look your best! Also, I don't want to get too technical here, but if you're still reading this, you realize how important this portrait is, and you sincerely want to look your absolute best. So... the "Transition Zone" of light, between the highlights and the shadows is what "paints" the contours of your face, and brings out your personality and "SPARKLE." So we want to be darn sure that this "Transition Zone" is perfect, too! I could go on and on, but you get the idea. Also, light is equally important for outdoor senior portraits! It must be absolutely PERFECT if we are to create a portrait of you which truly "Sparkles". So, the type of outdoor portraits you like will then determine the perfect TIME OF DAY to create the portraits. It's so important. Mistake #8 Determines A Great Portrait Or A Terrible One! Nine out of ten seniors don't realize how important posing is. The most important word when it comes to posing is "NATURAL." You absolutely don't want to look stiff and fake! One of the most common comments we hear from our clients is how "natural" the portraits look. Our seniors love how good they look, but they also love how "natural" they appear in the images. You see, I understand that you want to look really great, but also you don't want to be put into some weird, stupid, pathetic pose that makes you look stiff and unnatural. Yes, I will "guide" you so the composition and "look" of the portraits is really great. But I will NOT push you around and try to put you into unnatural positions that are just plain crazy looking. You and I will work together to help you look confident, comfortable, and just plain great. You want to be sure to select a photographer who will not "manhandle" you with the posing. Almost all the photographers in our state tend to touch their clients and push them around way too much when posing them. (In my humble opinion.) The posing is so important, and should not be done by sticking you in the middle of your back if you aren't sitting up quite straight enough! But that's what so many photographers do. Why? Because they're in a hurry. They have another 51 seniors to photograph before the day is over, and they can't take the time to "guide" you. They just stick their hand into your back, grab you by the shoulders, and get you to sit up straight. Not only does this make you really uncomfortable, but it also makes you look stiff! That's why I call it "guiding". I will guide you with words. I don't grab you or poke you. This is so important to helping you feel comfortable! However, Patti and I are really picky. We'll be very careful, and very attentive to detail. We may pick a little at your hair if something is out of place. We straighten your collar or sleeves. We straighten your shirt if it has a funny wrinkle in it. Don't worry about a thing! We'll make sure you look "like a million bucks"! We're very picky, but we don't manhandle you - and we won't drive you "nuts" with being overly picky either! In fact, Patti and I are called "Eagle Eye." And they call us that because we're so darn picky. Everything must be perfect before I expose the film. I'll work quickly, but carefully. The key thing with posing, is that you look honestly natural. The seniors I photograph tell me all the time how great their photographs look from a point of view of being natural. They say things like this: "It's like I just sat down naturally, by myself! That's exactly how I sit! I can't believe it! How'd you know that?" And you see, that's what "guiding" will do for your portraits, too! We're talking about where your arm is in the portrait. And if your hand is in the portrait, does it look natural? And so many seniors and their parents don't realize this when they're calling around to different photographers. They have no idea how important this is. So look at the photographs done by any photographer you're considering selecting. Do they look natural, or do they look "posed" or stiff? If you'll look at the photographs I've included throughout this website, you'll see how natural and comfortable they look. And read the comments the people have said about their senior portraits. Hopefully that will help you. Mistake #9 Is Of Enormous Importance! This mistake has ruined so many senior portraits! It's the mistake of not choosing a photographer who GUARANTEES THAT YOU WILL BE REALLY HAPPY - and who will give you all your money back, if you aren't! Here's our guarantee: "You will be THRILLED (not just 'satisfied') with your portraits, or we will do whatever is necessary for you to be thrilled, or we will return every penny of your money. No hassles and no hard feelings either. We want you to be THRILLED with your senior portraits, and will spare no effort or expense to see to it that you are! We absolutely guarantee it!" You see, only a photographer who really believes in his product and service is going to be willing to have such a powerful guarantee. So his guarantee is your first indication of whether or not you even want to work with him. I just can't stress this enough. Ask about the guarantee. Listen to their reaction. That will tell you if you want to trust your senior portraits to that photographer. Seniors Or Their Parents Don't Do It! What's this mistake? Not asking lots of questions when you're talking with photographers. Now, if you're still reading this, you certainly have the questions to ask, right? Remember, you are the customer - you have all the rights! You have the right to ask the tough questions, before you make any decisions! You ask them first about their guarantee, and see how they respond. Then you ask them if they will meet with you in person, at no charge, to discuss the clothing, etc, and give you a tour. Then you ask them if they will guarantee that they'll remove any and all blemishes you might have at the time of the photography. Then ask them about how they light the hair perfectly? Ask them if they know who Robert Alexander was, and if they understand his techniques. Then ask them how much time they are going to spend with you. And do they do outdoor portraits, as well as indoor portraits. Ask them if they are understanding if you call on the day of your session, to reschedule because "Today isn't the day." Ask them if they understand the importance of the correct lighting of the "Five Major Highlight Areas." Ask them if they know what a "Transition Zone" is. Ask them if their posing is natural, or more "posy and stiff." See how much you have learned so far? Pretty amazing, when you think about it, isn't it? Mistake #11 Can Ruin Everything! What's this mistake? It's choosing the WRONG PHOTOGRAPHER FOR YOUR SENIOR PORTRAIT. Everything depends on that one decision. And hopefully, now that you know these 11 major mistakes that most seniors or parents make - you won't make those mistakes! You'll be able to chose the right photographer for yourself, based on all this new found information you now have! Now, we may not be the right photographer for you. But the fact that you're still reading this means we probably are. Because we care about all the things I've talked about to you here. But the only way you'll really know for sure if we are right for you or not is to call us. Now, while it's fresh in your mind, pick up the phone, and call me so we can chat on the phone. No charge. No obligation. No sales pitch. We're not that kind of studio. CLICK HERE to find the number to call. We'll just chat. You can ask us any questions you may have. We'll see if there are any session times still remaining for seniors. If there are, and if you'd like to, we can set up a time for you to come in and we can show you around the studio, and chat a bit. There's still no charge or obligation. You do not need to have made a decision to hire us, before you can come in and chat with us! No way! Then, after we meet and chat, if you feel you'd like to have us create your senior portraits, fine. If not, fine also. We are here to help you in any way we can. But we're not here to pressure you into doing anything you don't want to do. The decisions are completely up to you. However, I do want to urge you to act immediately! My schedule is almost completely full at the time I'm updating this site. Very few senior session times remain! Why? Because I have such a great reputation from my past seniors I have worked with. They tell all their friends, and then they all call me, and my book just completely fills up. Plus, because we spend so much time with each one of the seniors we photograph, we can't photograph as many seniors as other photographers who have more of a "factory" arrangement.! So if anything I have said here sounded the least bit interesting to you, CALL NOW! DO NOT WAIT EVEN ONE DAY ON THIS! CLICK HERE right now to get the number to call. I Have A Very Special Offer For You...FREE! As long as you are one of the first 49 people to call me - just to chat - I will make you a FANTASTIC OFFER! 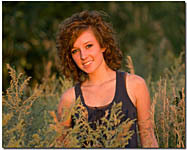 You can save 50% off the creation of your senior portraits (or those of your son or daughter)! That saves you a bunch of money! But you'll need to act quickly! Call right away. I can't wait to talk to you about your senior portraits! CLICK HERE. PS. Call us now. We have an excellent reputation in the community, and we'll take really good care of you. So call us today. We'll just chat. No charge, no obligation, no sales talk. But don't put it off. I know that at this moment, you aren't sure about your senior portraits. That's fine. But, please understand that because we spend so much time with each one of our seniors, we only have 49 session times remaining for this special offer. Once they are gone, you will not be able to get the 50% discount off the creation of the images. So call right now. PPS. One last thing. Having your senior portrait taken is such a personal thing, that you want to be sure you select a photographer who is not only really driven to help you look fantastic, but who you (or your son or daughter) also like and trust. That's why I urge you to read the comments from some of the other seniors we've photographed, and then call us and chat on the phone. This will give you an immediate feeling as to the type of people we are, so you can decide now, while we hopefully still have some session times available, whether or not you'd like to at least come in and chat. CLICK HERE to call right now. We will enjoy hearing from you!